Those who talk about Bob Bob Ricard generally mention three things: the awesome ‘Press for Champagne’ button installed at every table, the absolutely stunning and unique decor and the staff’s reluctance to ever let anyone order tap water. It’s always ‘Still or Sparkling’ as pointed out in an Evening Standard article earlier this week. The latter certainly remained true, as every time someone at our table took even a sip of our £4 per bottle water, it was promptly refilled, clearly in an effort to make sure we worked our way through as quickly as possibly so we’d have to order another. This was my second visit to ‘the Bobs’, the first being a blogger event, and just as before, the incredibly eclectic menu of both British and Russian favourites did not fail to impress me. 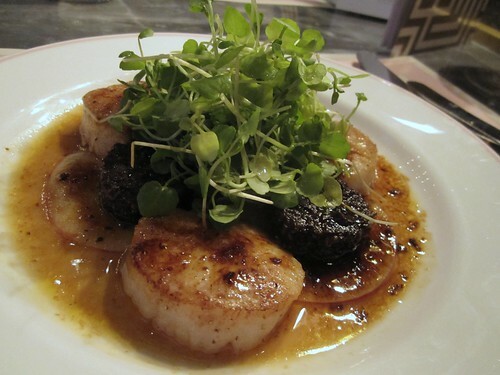 I started with the only dish I’ve had there before, the Scallops, Black Pudding and Apple (£10.50), and it was just as good as I remember it. It even managed to change the mind of a staunch Black Pudding Hater at our table. 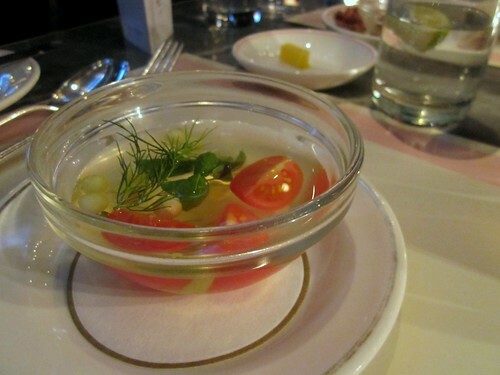 Unfortunately, the Chilled Tomato Soup (£6.75), complete with a futuristic over-the-top presentation, was a total miss. The first sip was pleasant, but shortly after it descneded into what I can only describe as the Gardens of Hell. A bit like drinking grass, really. 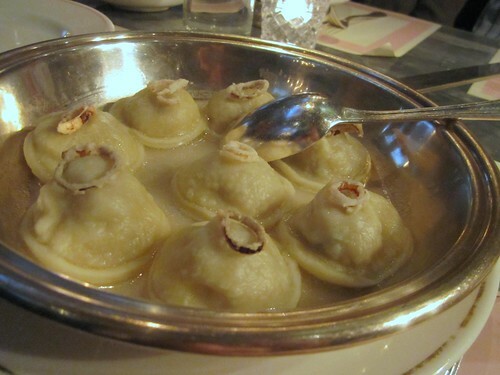 Across the mains, the Vareniki (£14.50) were lovely little dumplings bursting with a fantastic combination of truffled potato and mushrooms, topped with tiny fried onion rings. 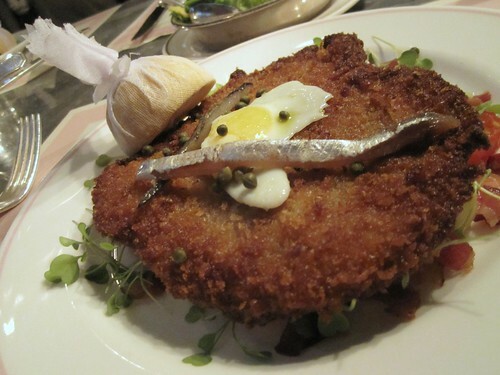 The Veal Holstein with Quail’s Egg, Anchovies and Truffled Mashed Potatoes (£21.50) was quite the hearty portion or pounded veal, served schnitzel-style. It made me very glad I didn’t go with the extra side dish our server tried to up sell. The serving of potatoes was much more than ‘a garnish’, as she tried to suggest. I was tempted by dessert. The souffle looked lovely, and I remember just about dying for the salted caramel ice cream, but as our food settled, I felt as if my stomach might pop if I put anything more into it. 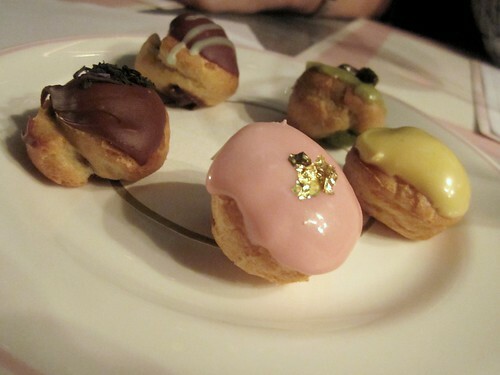 Still, when a small plate of Profiteroles (£6.50) arrived at the table on the house (presumably because I tweeted I was going that night), I couldn’t turn them down. The Rose Petal and Earl Gray and Chocolate, in particular, were fantastic. The buzz around Bob Bob Ricard seems to have decreased since last year, but I still found it to be fairly consistent with my last experience there. If one ‘not great’ dish and overly attentive service are the main detractors, I’d say they’re doing alright. A food blog from Melanie Seasons about om nom nom'ing all over London. Need more? Read my About page. Regular service to resume shortly! Blog at WordPress.com. · Theme: Pilcrow by Automattic.